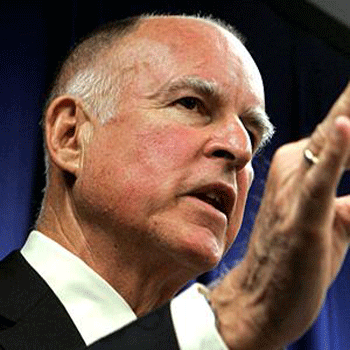 Since the untimely demise of the Millionaires Tax and the birth of the subsequent “compromise measure” Governor Jerry Brown has come out of the gates lauding the new ballot initiative as the result of his superior political experience and judgment. He has also made it clear that his vision is not one of progressive taxes in the service of social justice. Indeed, Brown recently challenged Democrats in the legislature to “man up” and make steep cuts to social services to help pave the way for the tax measure’s passage. In sum, his notion seems to be that only by demonstrating more austerity budgeting can we convince voters to pass the new measure. Note: Of course Brown was put in this box by the Republicans in the legislature (like our own would-be mayor Nathan Fletcher) who all signed the Grover Norquist pledge to never raise any revenue in any instance. That said, the Governor didn’t have to adopt his role with such relish. But that’s the austerity Democrats for you. A new poll confirms a fear we’ve raised before – Gov. Jerry Brown’s insistence on coupling the popular tax on millionaires with an unpopular increase in the sales tax could doom the revenue package this November – putting pressure on the governor and his allies to step up their political games and save the schools from disastrous cuts. More specifically, the new Public Policy Institute of California Poll shows the new tax measure receiving only 54% approval, down ten percent in only a month. What’s changed? While the taxes on the upper income brackets are still popular, the sales tax component of the measure is opposed by 52%. And did I mention that Molly Munger’s totally doomed tax initiative will also be on the ballot to muddy the waters? That’s not where you want to be in early May before any significant opposition has been mounted to your ballot initiative. He was the one who created this bad combination in the first place, and convinced the California Federation of Teachers to drop its Millionaires Tax – the clean measure that would have 65 percent support right now – in favor of a merged measure that’s a bit more progressive than Brown’s original idea. Only the political wonks will care that the sales tax is now at a quarter cent instead of a half –cent (the poor will still feel it). The anti-tax zealots will hang the sales tax around the neck of the compromise proposal and the social justice argument will be lost in favor of Brown’s “shared sacrifice” case designed to please the Chamber of Commerce. No matter how those in favor of this sell-out frame it, the new initiative blurs the issues and makes it more likely that California’s education system and vital public services will not get the revenue they need. Let’s be honest, even if the Governor’s measure passes it will largely result in stopping new education cuts from happening rather than restoring anything that has been cut. It’s a stopgap at best. What really needs to be done is to make the increases on millionaires permanent and then go for additional measures like the “split roll” on Proposition 13 by reassessing property taxes on large commercial enterprises while leaving individual homeowners untouched. Something like that could bring in billions more for education, but would require real political courage. So would finally looking at an oil severance tax like every other oil producing state in the country has or thinking about whether California’s growing prison-industrial complex is worth investing in over education. Imagine that. But for the short term, we need to work hard to convince people that saving education in California is worth paying a temporary minimal sales tax. If there’s no well-funded opposition, the Governor’s measure may still have a chance. Only then can we get down to the business of restoring the dream rather than just fighting for survival. The alternative is foreshadowed in UCSD’s decision to stop offering Transfer Admission Guarantee (TAG) agreements to community college students. The notion is that with a huge number of applications and growing budgetary pressure, the luxury of serving local folks and working class students of color can no longer be indulged. Out of state and foreign students pay more in tuition, so it’s time to throw community college students under the bus in favor of bigger cash cows. And if that isn’t bad enough, even some community college districts themselves, like the one in Santa Monica, are trying to implement dual track admissions systems that would favor students who can pay more to get into classes. The menacing implications of this with regard to class and race are clear: it’s the death of access and opportunity for all. And when you think of the mountains of debt our young people are graduating with, it’s a full-scale assault on the future. RIP California Dream. So, if you want to get on the fast track to a two-tiered educational system and even more devastating economic inequality in California, vote against the Governor’s measure. If you want to hold the line, vote for it–then keep fighting like hell for something a lot better. It certainly won’t come easily. The PTA/Molly Munger initiative is the only initiative that will start to restore our schools. Many of our school districts are hanging by a thread and the governor’s siphoning away more money last year due to his realignment plan, his initiative that only pays money that has already been taken from schools and now his proposed Weighted Student Formula will further damage a school system that is already compromised. PTAs and educational foundations can not fill in the huge gap that has been created. Many districts don’t even have the resources for PTA fundraising and educational foundations — and so the gap widens even further for some — creating varying degrees of inequity, again — in an overall compromised system. The PTA/Molly Munger, Our Children, Our Future initiative relies on a broad based, sliding scale tax — after deductions. Most people will pay what they normally pay towards PTA fundraisers and educational foundation silent auctions, but this time, it will have a transformative effect on the entire state and an entire generation of students. Today (May 7), a new poll had this to say: “after balanced messages about the initiatives that include negative information on both,” the Munger initiative came out in front in a head-to-head with the governor’s plan. According to the polling memo, “in an evenly funded campaign in which voters hear positives and negatives about both measures,” and are asked to choose between the two, voters support Munger’s plan 52 to 30 percent. Looks like it’s going to be an interesting build up to the November ballot!